By Justus Sustermans (Anversa 1597- Firenze 1681). Portrait of Young Giovan Carlo de’ Medici (1611-1663) as a Knight of Malta, oil on canvas, cm. 175 x 117. From the “Serie Aulica” of over 40 Medicean portraits. 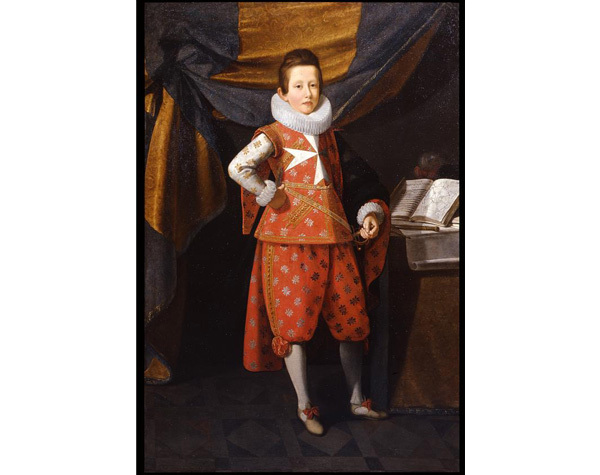 This portrait of Giovan Carlo de Medici belongs to the series painted starting from 1622 by Sustermans, the Flemish Medici court painter, who made individual portraits of the children of Cosimo II. Giovan Carlo’s portrait used to be in the Villa of Poggio Imperiale. The bright red costume is a departure from the rules for mourning wear after his father’s recent death (1621); on the table are the symbols of his future power, a plumed helmet and a book on fortress architecture.